Random House Trade Paperbacks, 9780812976717, 576pp. 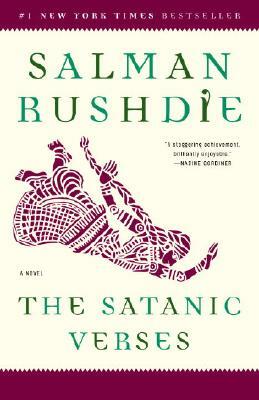 One of the most controversial and acclaimed novels ever written, The Satanic Verses is Salman Rushdie’s best-known and most galvanizing book. Set in a modern world filled with both mayhem and miracles, the story begins with a bang: the terrorist bombing of a London-bound jet in midflight. Two Indian actors of opposing sensibilities fall to earth, transformed into living symbols of what is angelic and evil. This is just the initial act in a magnificent odyssey that seamlessly merges the actual with the imagined. A book whose importance is eclipsed only by its quality, The Satanic Verses is a key work of our times. Salman Rushdie is the author of twelve novels—Grimus, Midnight’s Children (for which he won the Booker Prize and the Best of the Booker), Shame, The Satanic Verses, Haroun and the Sea of Stories, The Moor’s Last Sigh, The Ground Beneath Her Feet, Fury, Shalimar the Clown, The Enchantress of Florence, Luka and the Fire of Life, and Two Years Eight Months and Twenty-Eight Nights—and one collection of short stories: East, West. He has also published four works of nonfiction—Joseph Anton, The Jaguar Smile, Imaginary Homelands, and Step Across This Line—and co-edited two anthologies, Mirrorwork and Best American Short Stories 2008. He is a member of the American Academy of Arts and Letters and a Distinguished Writer in Residence at New York University. A former president of PEN American Center, Rushdie was knighted in 2007 for services to literature.